Making a tricky jump can sometimes be more rewarding than saving the galaxy. There's no denying that videogames are generally easier now than they were twenty years ago, but have we lost something by turning down the challenge level? In Issue 285 of The Escapist Chris Plante says that games like the super-difficult Super Meat Boy can remind us that some of the sweetest victories are the hardest won. Last month I survived the Tet Offensive, unraveled a high-level religious conspiracy, dethroned a malevolent king, became a benevolent king, commandeered a futuristic aircraft without an instruction manual and - most implausibly - swept the court with Michael Jordan like he was some junior college B-team chump. And it was all too easy. I grew so accustomed to guide arrows and objective overlays telling me where to go and what to do that it's a wonder I dressed myself each morning without a tutorial and a pat on the back ... Success came painlessly and reward regularly, to the point that I must have mentally glazed over during the last week of my month-long marathon, my hands making the perfunctory click or flick of the control pad, my aplomb fading into apathy ... Because now, after my annual Thanksgiving buffer, I can't say I remember how I did any of it. I remember scraps of stories. Sad, how someone who's saved the world can't recall how he did it. We remember games like Call of Duty in the same way we remember a movie. First the Cuban assassination plot, then the escape from Russia, and then something with Kennedy and yadda yadda yadda numbers, conspiracy, denouement. [But] Super Meat Boy falls squarely in the Mega Man camp. 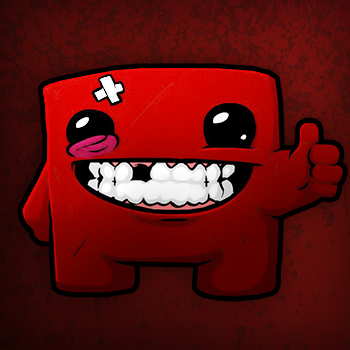 Hard-earned victory is its own motivator, not a carefully honed story or flashy set pieces ... Super Meat Boy goes the extra mile to help you remember how you played by creating a visualization of your hard work and dedication. Upon completing a stage, a replay video shows at once all your futile efforts to reach the goal along with the single success. It's a flurry of bloody missteps, but beyond that it's like watching your brain learn the game: Tools exploited, challenge solved. While a decrease in the average difficulty was a natural evolution of videogames as they transitioned from the arcades into people's living rooms, Plante thinks there is still room for the occasional "ludomasochistic" game, just to remind people what they feel like. You can read more about it in his article, "Hard Earned Victories."